It was my first clue that atheists are my brother and sisters of a different faith, and every word they speak speaks of faith. Like me, they go as far as the legs of reason will carry them – and then they leap. Life of Pi not only deals with questions of faith through the eyes of the central character Pi but it also requires from its audience a great leap of faith to believe that a boy could survive for so long in a lifeboat with a tiger. For some people, faith helps them cope with evil and death. For others, it illuminates their lives and gives meaning. Look closely at this film poster then discuss these questions with a partner or in your group. 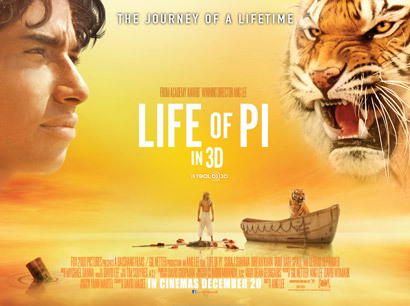 How would you describe the different representations of the characters of Pi and the tiger, Richard Parker? Think about the close-ups and the long shot. Why do you think they have been portrayed like this? What is the effect of positioning their faces opposite each other in the poster? What does the use of orange and yellow to represent the sky and the sea suggest about the film? How do you interpret the tagline ‘The Journey of a Lifetime’? In what ways does this poster suggest a film about faith and belief? There are no grounds for going beyond a scientific explanation of reality and no sound reason for believing anything but our sense experiences…God does not exist. From what you know of the film, in what ways does the story of Pi challenge Mr Kumar’s atheist position?